Records are made to be broken. 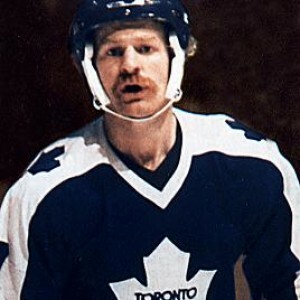 But, more than 40 years after Darryl Sittler set the record for most points scored in a single game, it has yet to be matched, much less broken. 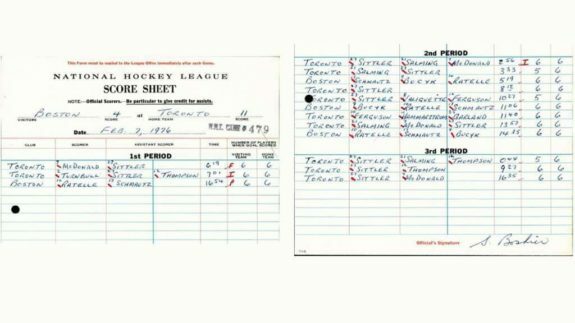 Sittler’s name literally covered the scoresheet as he piled up six goals and four assists in the Toronto Maple Leafs’ 11-4 rout over the Boston Bruins on Feb. 7, 1976, at Maple Leaf Gardens. 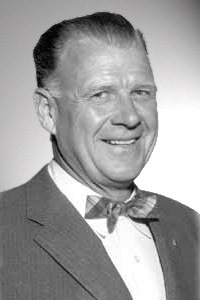 Entering the game, the Don Cherry-coached Bruins led the Adams Division with 73 points. They were on a seven-game winning streak. They were 20 points above the Leafs in the standings and had just steamrolled the Pittsburgh Penguins at the Boston Garden, 5-1. The Bruins’ backup netminder, Dave Reece, notched that win and had compiled a 7-4-2 record while Gilles Gilbert was out with a knee injury. With Gilbert still sidelined, Gerry Cheevers was dressed as Reece’s backup. Cheevers, the Bruins former goalie, had been signed a few weeks earlier in order to solidify their depth in goal. As it turned out, the impending loss to the Leafs would be their only loss over a 16-game stretch, as they went on a 15-1-1 surge. The Leafs were struggling, having won only once in their previous seven games (1-4-2). They were 21-20-11 overall. 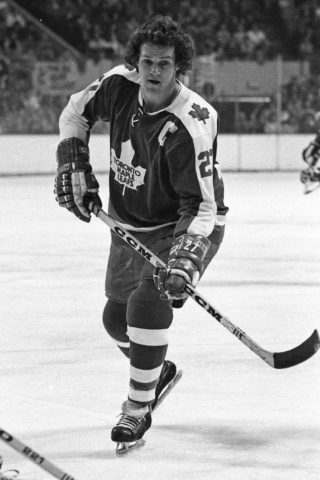 Though Sittler was nursing a shoulder injury, the captain had managed to score five goals and ten assists in his previous 17 games. His linemates were constantly changing almost every game. In a game on Feb. 1 in Pittsburgh, he skated with six different teammates on his line. Before the game, the Leafs cantankerous owner, Harold Ballard, blasted his captain for not being a No. 1 center. “We’d set off a time bomb if we had a hell of a center in there,” he told the Toronto Star before the game. He wanted a scoring centerman between top wingers, Lanny McDonald and Errol Thompson. The line paid instant dividends – both Sittler and McDonald lit the lamp behind Caps’ goalie Ron Low and the game ended in a 4-4 tie against the woeful Washington Capitals at Maple Leaf Gardens. That said, the Caps were a terrible team and only had managed 16 points on the season. Despite being productive, Kelly was going to split the line up. He didn’t want to put so many of his stars on the same line. The trio begged Kelly for a full week to prove themselves and made the most of it. Before the glorious game in February, Maurice “The Rocket” Richard held the record for most points in a single game: eight. He racked up five goals and three assists in a 9-1 victory over the Detroit Red Wings on Dec. 28, 1944. Bert ‘Dirty Bertie’ Olmstead, playing with ‘Boom Boom’ Geoffrion and Jean Beliveau on the Canadiens, matched the Rocket’s eight points in a 12-1 shellacking of the Chicago Blackhawks on Jan. 9, 1954. The Leafs-Bruins game was a nationally televised game on Hockey Night in Canada. Before the game, Sittler took his usual nap, but his late wife, Wendy, was eight months pregnant with their second child and was too tired to cook his usual meal. Since he was too busy running errands, Sittler picked up some chicken and french fries from Swiss Chalet and wolfed it down in his car on the way to the Gardens. He tried replicating this meal on several occasions, but it never had the same good luck. In the first period, Sittler set up two goals, getting assists on goals by linemate Lanny McDonald and defenseman Ian Turnbull. It was very much business as usual. The Leafs held a 2-1 lead after one period of play. Sittler collected points three through seven in the second period; his first hat trick of the night and a pair of assists on goals by Borje Salming. This three-goal, two-assist outburst was, in itself, pretty remarkable. After his fifth point of the night, Sittler was feeling euphoric. As excited as he was, the record never crossed his mind. It wasn’t until he was in the locker room with seven points (3G, 4A) that he felt something special was going on. Stan Obodiac, a statistician at the Gardens, informed Sittler that he was just a point away from matching Richard’s record. The Leafs held a commanding 8-4 lead, but the entire locker room and arena were buzzing with anticipation about a possible new scoring record. Just 44 seconds into the third period, Sittler banged home a pass from Salming just outside the crease. The goal, his fourth of the night and eighth point of the game, officially tied the record. At 9:27 of the period, Sittler wristed a shot past Reece for his ninth point of the game. The point vaulted him into new point-scoring territory and captured the imagination of hockey fans across all of Canada, making him a national star. At 16:35 of the third period, Sittler completed his second hat trick of the game when a pass meant for his linemate ricocheted off a Bruins’ defenseman’s skate and found the back of the net. The Leaf Captain threw his hands in the air and shook his head in his own disbelief. It was the final point in his historic 10-point game. After the game, there wasn’t a crazy, all-out party. It was just another Saturday night post-game and the Leafs had to play the next night at home. After a media frenzy, most of the team went out to Bobby Rubino’s in Mississauga for food, a local favorite that they frequented after most home games. Harold Ballard ate his words. Aside from eating his words with a dose of salt, Ballard later gave Sittler a silver tea service to mark his milestone achievement. 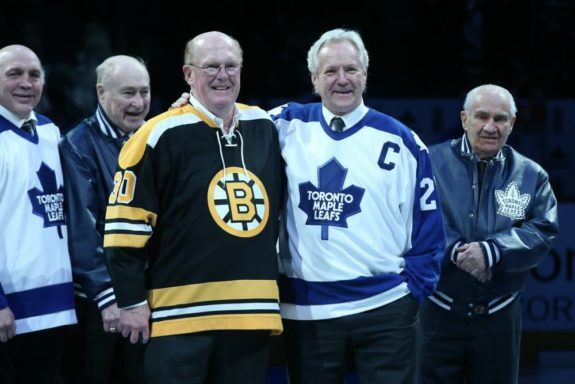 The dynamic line of Sittler centering McDonald and Thompson lasted for more than two years. It was an offensive threat every time it took the ice, especially when the offensive-minded blueliners Borje Salming and Ian Turnbull were on the ice. 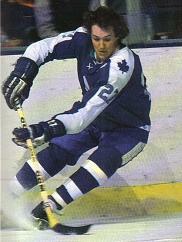 Sittler’s Hall of Fame career ended with 484 goals and 1,121 points. He was inducted into the Hockey Hall of Fame in 1989 and chosen as one of the 100 Greatest NHL Players as part of the League’s Centennial Celebration. McDonald, a 1992 Hockey Hall of Fame inductee, scored 500 goals and put up 1,006 points in 1,111 NHL games. Thompson finished his career with 393 points in 599 NHL games. Reece made 29 saves that night, one more than Wayne Thomas, who was in net for Toronto. “A lot of those goals, Reece, he didn’t have a chance on them much. There were a lot of good goals, just inside the post. He wasn’t getting a whole lot of protection out there,” said Sittler. A commonly told joke about Reece was that he was so distraught after giving up 11 goals that he tried to commit suicide by jumping in front of a train. However, the train went through his legs. After the game, Reece was sent back to the minors as scheduled. He never played another NHL game and retired the following season. Later, Reece went on to be a high school guidance counselor. “I was able to translate a failure into helping people,” said Reece. In 2006, at a television special to commemorate the 30th anniversary of the game, Sittler and Reece attended a ceremony at Air Canada Centre. Now that time has passed, Reece is able to laugh about surrendering so many goals and now cherishes being part of hockey history. He joked that his teammates backchecked harder to the bench than to their own end, just to avoid a minus. Sittler’s mark continues to stand the test of time. Since that glorious night, ten players have reached eight points in a game, but none have scored nine, let alone ten. Mario Lemieux (3) and Wayne Gretzky (2) are the only ones to score eight points in a game more than once. Sadly, Sittler has nothing but memories of the game. Things were different back then–collectibles weren’t a ‘thing’. The puck and his jersey were never set aside, they were simply reused and are long gone. He saved the stick he used that night but it was lost in a fire. Even the Hockey Hall of Fame barely has anything other than a ticket stub and some programs. 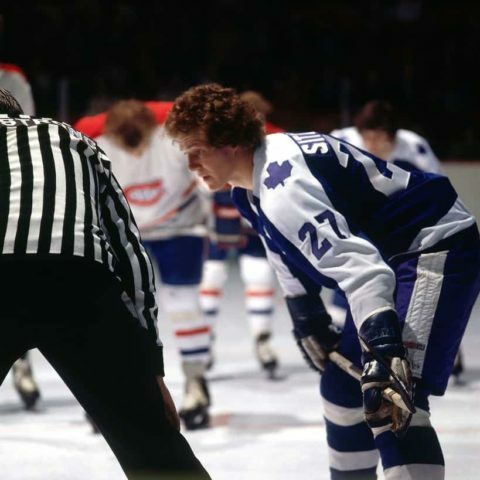 While playing, Sittler never had a firm grasp on how difficult the record was to beat, figuring dominant players like Wayne Gretzky and Mario Lemieux would beat it eventually. He figures everything will fall into place for one of today’s superstars–Connor McDavid, Alex Ovechkin or Sidney Crosby to break his record. “They could change the size of the goal nets or the goaltenders’ equipment and maybe 15 or 20 years from now the game may not be like it is today. I’d be happy for the guy that broke the 10-point game record, but at the same time I want to hold the record,” said Sittler. His historic performance has stood the test of time for more than 40 years. “I never thought I’d hold it forever. But as time goes by now…” Sittler then shrugged with a grin on his face.